First time I met this unassuming artist was at the house of my dear friends Al and Lynn Geller. Mike Shuler is a fascinating individual. His woodturnings are absolutely phenomenal. Apparently his fascination with wood and tools started at an early age. According to Mike he was always playing around with objects and odd tools, forever trying to fit pieces together. During the winter of 1963, the turned and fluted legs of an heirloom chair which had been in his family for three generations got his attention. At the age of thirteen he pondered the engineering mystery of symmetrical wood forms. Never having seen a lathe he began to realize that if the wood could spin it could be cut into a round form. According to him, he scavenged the basic components for a lathe and using a pocket knife spent the rest of that winter making miniatures – goblets, light bulbs, marbles – anything rounded. The open vessel form now expresses the aesthetic of his body of work. These forms are grouped in two parts. One is ‘segmented’ and the other is ‘organica’. All are lathe-turned vessels. The segmented vessels are made of hundreds or thousands of slender precisely cut mostly exotic hardwoods which form intense and intricate patterns. No paints, pigments or stains of any kind are used, except in the maple bowls where the glue is tinted red. Otherwise, all colors are the natural color of the species. 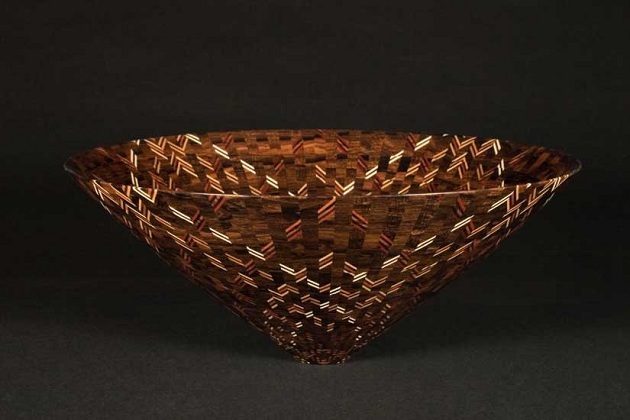 A large segmented bowl may consist of as many as 5,000 segments of wood and the smaller bowls up to 2,000 segments (absolutely amazing). The organica are vessels formed from natural objects such as pinecones, blossoms such as protea or banksia, thistles, artichokes and other vegetative forms. The vessel is created through a subtractive process involving resin impregnation and the lathe to reveal a beauty within the form usually hidden from view. The effort behind these two bodies of work is to simply create imagery that is gesturing to the beautiful and thereby nourishing to the human spirit. Modern artistic figure skating expresses intense efforts by the performers to free themselves from the bounds of everyday motion, to spin ethereally through the air, forever straining against gravity, an illustration of the spirit straining against the limitations of the body. The imagery within the segmented bowls seem to capture that same tension with their intricate designs reflecting the artistic spirit straining for release. Mike Shuler is fantastic! I have held some of his work in my hands. I still wondered how it was done!